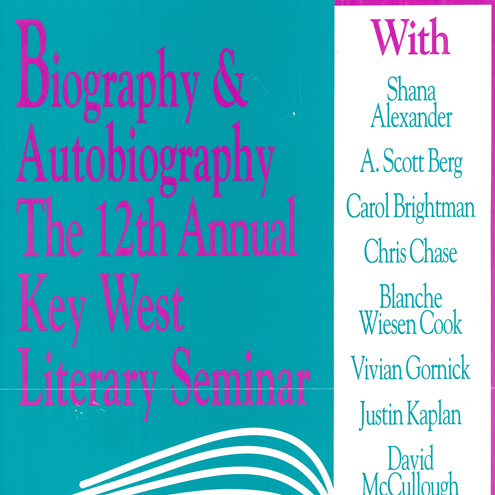 Coverage of the 1994 Seminar: "Biography & Autography"
Presenters: Shana Alexander, A. Scott Berg, Carol Brightman, Chris Chase, Blanche Wiesen Cook, Vivian Gornick, Justin Kaplan, David McCullough, Nancy Milford, James Merrill, Phyllis Rose, Edmund White, Geoffrey Wolff, and William Wright. Writers’ Workshop Faculty: A. Scott Berg, Vivian Gornick and Phillip A. Marcus. KWLS founder David Kaufelt (top right) and writers Carl Friedman (top left), G.L. Durlacher (left) and Carl Friedman pose for a group photo before the pre-seminar presentation, "The Shadow of Anne Frank: Jewish-Dutch Autobiography after the Holocaust". Photo by Richard Watherwax. Author and Auschwitz survivor G.L. Durlacher. Photo by Richard Watherwax. Author Carl Friedman. Photo by Richard Watherwax. Writer Samuel Dresden. Photo by Richard Watherwax. (L-R) Authors Justin Kaplan, Carol Brightman, Nancy Milford and Edmund White during their panel, "Literary Biography". (L-R) Authors Justin Kaplan, Carol Brightman, Nancy Milford and Edmund White signing books for seminar attendees. Authors Carol Brightman, Nancy Milford and Edmund White signing books for seminar attendees. Writer Edmund White signing books for seminar attendees. Pulitzer Prize winning author Justin Kaplan signing books for seminar attendees. Nancy Milford, author of "Zelda, A Biography". Author Carol Brightman of the biography, "Writing Dangerously: Mary McCarthy and Her World" signs books for seminar attendees. Nancy Milford (center) with author of "Eleanor Roosevelt", Blache Wiesen Cook (right). (L-R) Phyllis Rose, Shana Alexander, Geoffrey Wolff and Vivian Gornick during their panel, "Writing About Family". Photo by Richard Watherwax. Authors Geoffrey Wolff, Vivian Gornick and Phyllis Rose. Photo by Richard Watherwax. Authors Phyllis Rose, Vivian Gornick and Geoffrey Wolff signing books. Photo by Richard Watherwax. Author Geoffrey Wolff signs a book for an attendee. Photo by Richard Watherwax. KWLS board member Frank E. Taylor with Kate McCarthy. Photo by Richard Watherwax. The dedication of the San Carlos Institute into the National Registry of Literary Landmarks with president Rafael Peñalver unveiling the plaque alongside KWLS Executive Director Monica Haskell (second from the right). Photo by Richard Watherwax.